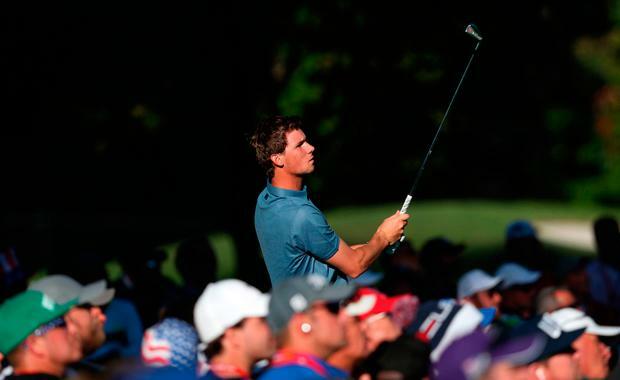 Thomas Pieters, Europe's standout performer at last week's Ryder Cup, has indicated he wants to earn a PGA Tour card. But Nicolas Colsaerts, his fellow Belgian and close confidant, does not expect him to play in the US permanently because he "doesn't like Americans that much". Colsaerts is sharing a house with Pieters at this week's Dunhill Links Championship - the glorified Pro-Am taking place at St Andrews, Kingsbarns and Carnoustie - and has some interesting views to share about his 24-year-old friend. "We have talked about it (playing in the US) a little bit," Colsaerts said of his friend, who studied at the University of Illinois. "I don't think he would want to be surrounded by Americans 365 days a year. "People think that because he went to the US that he only wants to play the PGA Tour, but he has shown at the Ryder Cup, with his shushing of the crowd and the way he plays, that he doesn't like them that much." Pieters has credited his experience at Illinois as being "crucial in my development" but has admitted "adjusting to the American way of life was really tough". He quit his course one year early to become a European Tour pro and although he made a huge impact last week - becoming the first European to record four points on his Ryder Cup debut - Colsaerts think he will resist the overtures to take up full-time status. Colsaerts tried to crack the US circuit in 2013 after making an impression in the 2012 Ryder Cup but could not settle and returned to Europe in 2014. "I don't see Thomas moving there and playing any time soon," said Colsaerts (33). "He is happy living in Antwerp, where he has a life." Pieters is one six members of Europe's team at the Dunhill, along with Lee Westwood, Danny Willett, Matthew Fitzpatrick and Rafael Cabrera Bello. There was disappointment for next week's British Masters at The Grove in Hertfordshire when Justin Rose announced he is taking two months off for "rest and recovery". Rose suffered a herniated disc earlier in the season. Elsewhere, Tiger Woods, who plans to make his PGA Tour return next week after more than a year on the sidelines, has been appointed as one of three vice-captains to US skipper Steve Stricker for next year's Presidents Cup in New Jersey. Woods will join Fred Couples and triumphant Ryder Cup captain Davis Love III as assistants for the biennial team competition against the Internationals to be played at Liberty National in Jersey City. "It's just a tremendous honour," said Woods. "We've been friends for close to 20 years now." Former world No 1 Woods, who got his first taste as a vice-captain during last week's Ryder Cup, could still play his way on to the Presidents Cup team. Woods, who has not played competitive golf since the Wyndham Championship in late August 2015 while recovering from multiple back surgeries, intends to make his PGA Tour comeback at next week's Safeway Open in Napa, California.